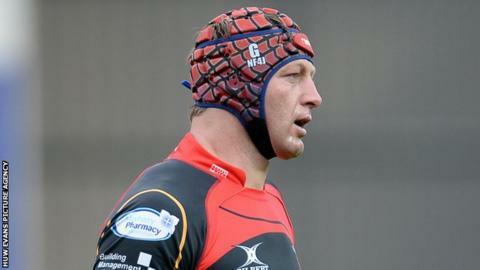 Newport Gwent Dragons' former Wales lock Ian Gough will retire from rugby at the end of the season. Gough, in his second spell with the Dragons, won 64 caps for Wales and played in two Grand Slam winning sides. The 38-year-old started out at Newport and also played for Pontypridd, Ospreys and London Irish. "I have had such a long rugby career and I have been lucky that my body has allowed me to do so in the pro era," he said. "My career is something that I will look fondly on and I have no regrets through the good times and the bad." Panteg-born Gough made his Wales debut against South Africa in 1998 and was a member of the squad that won Grand Slams in 2005 and 2008, winning his last cap in 2010. Gough made over 130 appearances for Newport and played in the Black & Ambers' Principality Cup Final win over Neath in 2001. Following a spell with Pontypridd he rejoined Newport Gwent Dragons after the introduction of regional rugby in 2003 and made 92 appearances in his first stint with the Men of Gwent. In 2007 he joined Ospreys and made 119 appearances during six years with the region before joining London Irish on a short-term deal. He returned to the Dragons for the 2014-15 season and has appeared 10 times for the Rodney Parade side so far this campaign. Gough has made a total of 211 regional appearances since 2003, second only to former Dragons lock Adam Jones, who played in 228 games.